Tropical woods are all very dense and have similar tone characteristics. The reason why some are more expensive than others is in relation with the rarity of the wood and the resistance that the wood offers when it is worked by the luthier. It is not the beauty nor the sound that these tonewoods deliver the reasons why some are more expensive than others. Aesthetically, it is a very personal choice that inclines you to have a preference for darker Vs. lighter woods, or highly flamed cuts Vs. more uniform cuts. When it comes to choosing the wood for the back and sides and for the top, you may feel a little lost because you do not know what is more convenient for you. Here, I'll be explaining the factors to be kept in mind when you make your choice. The Deepest basses, well defined trebles, excellent tone wood, very responsive, with aterrific tap tone. I find the mid-bass ranges of this wood to be very human-like in quality.The most expensive of all the tropical woods. It is also the one guitar sound that is really different from all the rest. Macassar Ebony, Maple and Walnut deliver very similar acoustic results at a fraction of the price of African Blackwood. African Blackwood is a member of the Rosewood familyhas long been credited by guitar builders as the ”holy grail” of tonewoods. With a strong responsive taptone that surpasses even Brazilian Rosewood, it can contribute significant volume, power and clarity of sound to a guitar. African Blackwood is very difficult to work and very hard to bend, but it is strikingly beautiful and polishes to a high luster. African Blackwood is a small tree and as a result, obtaining guitar sets is difficult and this is the main reason why it is such an expensive tonewood. Ambrosiaa Maple is essentially a regular Maple tree that has been co-living with a liken called "Ambrosia" that is responsible for the blue, turquoise and beige coloration of the grain. The liken is transported by a small beetle. It is quite stunning and shows nature marvelous way of making art I was able to get a hold of this beautiful wood for the first time and I know it is quite rare to come by. It is the only wood that can offer a turquoise/blue coloration and it is because of the collaboration of this unique liken. The sonorous qualities of the wood areidentical to standard Maple:Strong, well defined bass and clear trebles. Ambrosia Maple is not always readily available but given enough time I can always get a marvelous set on request. Bastogne Walnut is a rare, natural occurring hybrid between California English Walnut and Claro Walnut that is found in typically northern California. It can vary greatly in figure and color but is usually a rich dark brown with some very dark and swirly figuring almost as dark as black. Bastogne Walnut is a very strong, heavy wood and is the densest of all walnuts. It takes long to dry but is not as difficult as Claro walnut. Because it is so rare, Bastogne walnut is highly prized for making fine musical instruments and the rich bass, perfect separation of voices and sustain it offers is living proof of that. I started sing this amazing wood in mid 2013 and I am a declared fan. Bloodwood is a Tropical South American wood with extreme density, and has a pronounced blunting effect on cutters. The wood is not easy to be worked and calls forexperienced luthiers. Those persistent enough to bear with the difficulties of working with Bloodwood to the finishing stage are rewarded with an exceptional and lustrous red surface and the amazing sound it offers to the finished instrument. The bass is always clear and crisp with a punch whilst the trebles and mid ranges are perfectly defined and sustained. The color is reminiscent of the vital fluid it refers to and typically, when combined with Spruce, i creates some astonishingly beautiful instruments. Well Balanced sound, good volume and perfect balance of voices. Quick response. Possesses all the characteristics of the more luxurious Brazilian relative but has less presence in the sound making it an ideal choice for Classical, Bossa Nova & session musicians that need warmth, introspection and good separation of voices.It finishes marvelously well and is very stable and resonant. It is also widely known as Pau Ferro and in numerous occasions it appears with wonderfully striped grain. It is one of my favorite Tropical species. Unlike its close relative Brazilian Rosewood, Pau Ferro needs very little or no pampering when it comes to humidity control etc. It is without any doubt one of my all time favorite Tropical tonewoods. Brazilain Rosewood (Dalbergia Nigra) is often referred to as the "Rolls Royce" of Tonewoods. It has earned the reputation after having delivered some of the best instruments of the past century. 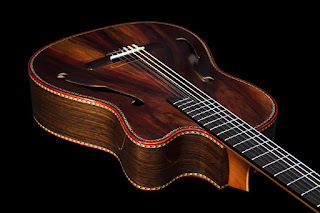 Still, the speculation around the species has made it so expensive that I think the luthier is better off using African Blackwood and other not so "speculated" species. Everything abut the tone of Brazilian Rosewood is practically speaking a dream type of sound. The species needs quite a bit of pampering when it comes to humidity therefore, if you are not the type of good carer that the species requires, I suggest you use more sturdy Tropical Tonewood. Well balanced tone on all registers. Quick response. Very similar to Koa and Maple.The basses are very round and the mid ranges excel. The trebles shine very brightly.The looks of Bubinga guitars is simply spectacular. The grain resembles a waterfall or a river running and the patterns can be stunning! It is a Royalty tonewood from Africa that pleases the eye and ear. It is a much better tonewood than it’s been given credit for, it is harder and heavier than eitherBrazilian or Indian Rosewood. It is sometimes called African Rosewood, although it’s not a Dalbergia. It has a medium texture with interlocking grain. It’s pinkish-mauve cast oxidizes to a nice brownish-red over time. It can be difficult to bend. African Rosewood is one of the best values in a tonewood. It s also called waterfall for the kind of figure found in some sets of Bubinga. The liquid, three dimensional texture of the wood seems to be a fluid in motion. Just like the Dalbergias, African Rosewood offers a marvelous sound that covers the bass with roundness and sustain while preserving the clarity and great separation of the trebles and mid ranges. Almost identical to Brazilian Rosewood, can be called Brazilian rosewood younger brother. Liquid tone and great color palette. It is strikingly beautiful and the finished instrument can get anybody stunned.The sound is mysterious, deep and clear at the same time. Cocobolo is a hard and heavy wood with irregular grain with a medium fine texture which is a close relative of Brazilian Rosewood. They are both Dalbergias. It finishes fantastically and it offers some of the best looking figures any builder can dream of for a concert guitar. The palette of colors it displays ranges from black, brown, orange and yellow and I often thing of the best sunsets when I look at the grain of Cocobolo. The sound is warm yet brilliant and powerful. It makes Cocobolo stand out as one of the best tonewoods on the planet. Definitely one of my favorites. Purple Heart is a fabulous tonewood with some of the best characteristics for a world class tonewood. It is very dense and projects marvelously. It is in the same league as African Blackwood, Lapacho and Brazilian Rosewood without the drawbacks of Brazilian Rosewood that is ahigh maintenance wood. Definitely one of my favorites. Purple Heart guitars offer perfect basses that are defined to perfection and always accompanied by lively yer clear trebles. Top notch sustain and projection are also the norm with this marvelous tonewood. Curly Purple Heart is Hard to come by. The curly variety is very scarce. Gabon Ebony is the standard for black in lumber. It has been found in Egyptian tombs and is used on the fingerboard of violins. Avery dense wood with specific gravity of 1.2, it is usually only available in widths less than 6” and lengths less than 48”. This is partly do to where the trees grow in central West Africa. There are few roads and most of the billets have to be hand carried out of the jungle. It is the rarest of the ebony woods. Very dense tight grained wood. If you think Zorro, this is the wood for the job. It finishes fantastically and makes every marquetry decoration stand out marvelously. Every guitar I built using Gabon Ebony produced a fabulous guitar with amazingly powerful bass, rich mid tones and ringing trebles. Sustain and projection are always off the chats. Indian Rosewood, is very stable, clear tone and good separation of voices. The most popular wood for classical guitar construction especially since Brazilian Rosewood has gone up in price. I call it the Volkswagen of tropical woods. Low priced and very stable. Makes for very"predictable" guitars. It offers great playing and looks without breaking the bank. Indian Rosewood has been used for guitar backs and sides for many decades. The sets I use are mostly imported from East India, Madagascar and Indonesia. Indian Rosewood has come into common usage starting in the mid 1960s when the more well known Brazilian Rosewood became less available in the quantities needed for large scale guitar production. High quality Indian Rosewood logs were plentiful and commercially available to the major markets when the Brazilian government stopped the export of Brazilian Rosewood logs. Fortunately, Indian Rosewood was also found to be an excellent alternative to Brazilian Rosewood both visually and tonally. Every guitar I build using East Indian Rosewood delivers an excellent tone with top notch projection, clarity and superb sustain. No wonder it is slowly and steadily becoming the most used tonewood for classical guitar construction on the planet. Hawaiian Koa has a clear warm sounding basses and crystal clear trebles. Similar tone characteristics as Bubinga and Tasmanian Blackwood. Tone wise, it is particularly striking when built as a Double top. The wood presents a gorgeous grain. This amazing Hawaiian species is steadily becoming one of the most sought after Tropical tonewoods on the planet. Its grain is always stunning and it always delivers amazingly sounding concert instruments. Still, I find it a little overpriced considering that Black Limba or Goncalo Alvesproduce similar results at lower price. Still, it is a wood in vogue and if it were not so expensive, it would definitely be among my favorites tropical tonewoods. Round basses and very clear trebles. Reverb and projection are outstanding and comparable to African Blackwood and Cocobolo. competes with Brazilian rosewood when it comes to punch and definition of voices. Superb tap tone and a collectiblesince only a few Lapacho guitars have ever been built. If not the only builder, I am one of a handful that ever managed to build concert guitars using Lapacho. The wood is incredibly hard but the luthier is filled with pride when he ears the sound of the finished instrument. I am quite certain that in time this wood will be part of the "tropical woods Royalty". It is simply Stunning. It is Paraguay's most sought after species and it withstands fluctuations n humidity and temperature marvelously. Laurel is a wonderful species that is found throughout the Americas. The California variety is particularly beautiful. It possesses a tremendous tap tone andalways produces top of the line guitars. It is relatively cheap when compared to woods that deliver similar sound at much higher costs like Blackwood or Brazilian rosewood. Some sets also offer a stunning grain although the norm is that the figure is mos times moderate. The set displayed here is the standard look of California Laurel. The sound is vibrant and lively. The bass rings generously and is accompanied by rich overtones, mid ranges and brilliant trebles. Perfect sound ! Laurel works marvelously well with Spruce, Cedar and Redwood. I never used it in conjunction with Port Orford Cedar but I am sure it must deliver a terrific instrument.